The SW-RCD anchor is a load distributive compression type removable anchor that offers a complete solution where anchorage systems required to be removed once they become redundant. Often city municipalities and the like, object to obstructions left in the ground beyond completion of construction for fear they will conflict with future developments or seek third party approval. The SW-RCD anchors are a cost effective solutions where the use of conventional tieback anchors are forbidden or discarded due to logistical and or practical site constraints. The entire steel strand can be quickly and easily removed or reengaged with limited site access. 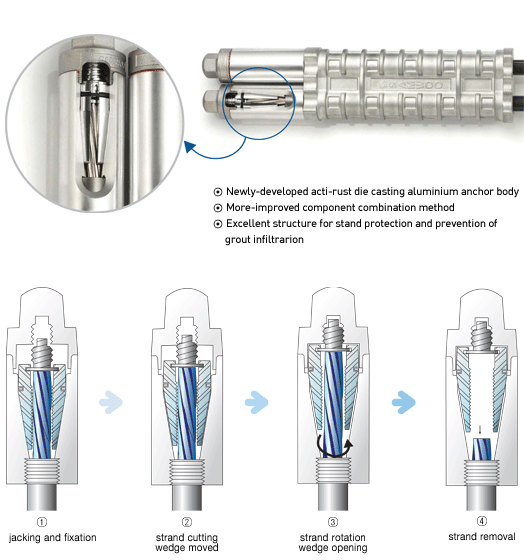 Simply rotate the strand to release the wedges which are fixed in the end of the anchor body and the entire steel strand is easily withdrawn through the PE sheath leaving the small aluminium anchor body. The removal process is generally done by hand. In addition, allowing the steel strand to penetrate through the inside and be secured to the end of the anchor body, distributes the jacking force along the length of the anchor body which maximizes the effective cross-sectional area of the grout body. Since their initial development these anchors have been employed in numerous projects around the world providing lateral support to temporary sheeting and shoring conditions. When fixing the SW-RCD anchor, the removal screw ① is located at the upper groove of the wedge, and the strand is completely bound at this point. After completing the construction and when removing the strand, the confining force is dissolved by cutting the head part of the anchor, and strand ②, wedge ③, and removal screw ① has weak confining forces. Then, by rotating strand ②, the removal screw moves to the removal net ④ inside of the upper head cap, and the wedge also moves. Therefore, the strand is freed from confinement, and removed. The SW-RCD anchor is manufactured in a semi-automated standardised facility with state of the art equipment resulting in stringent quality control. Anchors are fully assembled and packaged in coils for transportation. The SW-RCD anchor is an internationally patented product with the design based on compression type, load distribution theory.